15 Guests 1 Member 6 Bots (+32 bot dupes) 1 spammer also just said hi. If your favorite program is missing or there's some weird bug, please tell me about it. You should team up with Woolyss and keep a current list forever. Awesome! I have most of those programs but some are hard to find (paragon5 was MIA for a while) and having all sorts of readme files is super cool. I'll look through and see if there's any obscure program I can add, but you seem to have it well covered. I never tried the Pixelh8 MusicTech software. Is any reason for it not working on my EMS cartridge? It's a known bug... Nobody knows why. it's a very concise archive. what about a "download the entire archive" zip option? brilliant stuff, really useful..one little glitch, on your pixelh8 page the music tech properformer download link has a milkytracker icon....now that would be a clever port! That's what all zip files look like. I actually started off by copying all the icons from Zabu's stuff page that I'm hosting and then added/tweaked icons as needed. And the MT icon, originally used for all binary files, remains for GBA files. I'll try to find a better icon for gba files. Looks good. Glad to see it coming along well, even if it has only been for about 2 months. great work nitro as usual! Do you guys think you'd be able to host a mirror of this site? 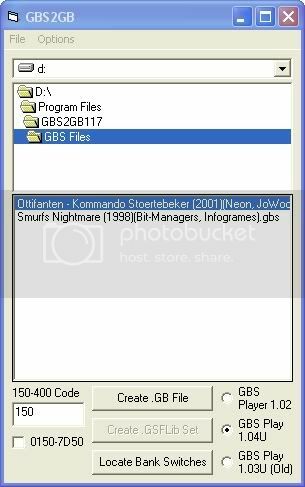 It's not all gameboy related, but a lot of it is related to gbs files. If there's a program within there that is worth separating from the rest, for the purposes of what you've got going, it's gbs2gb (you can 'ctrl + f' it to find it). GBS2GB 1.17 allows you to convert gbs files into gb roms for playback on hardware. Without it, I don't know of a good working solution to sample game boy soundtracks from hardware. are there any tools to create a .gbs file on a desktop computer?